State-of-the art liquid handling systems are generally pump-driven systems connected with valves and tubes. These systems are manually assembled, expensive, and unreliable. With the growth of the genomic and drug industries, we are moving toward increasingly complex biological processes requiring very small volume liquid manipulation capability. Manually assembled mechanical systems do not scale to parallel manipulation of large amounts of small volume liquids. However, the electronics industry has demonstrated how to build robust integrated systems for information manipulation. With this as our motivation, we look toward electronics and integrated circuits to bring miniaturization, complexity, and integration to enable the next generation of biology. The process of electrically moving liquid has existed since the 1875 experiments of physicist Gabriel Lippmann. Since then, significant work has been done using electrowetting for paper-like displays. A larger interest in the technique has been in the automation of biology—popularly known as digital microfluidics. We have been developing a digital microfluidic lab-on-a-chip based on the principles of electrowetting on dielectric (EWOD). EWOD allows for the precise control of motion, merging, and stirring of biological samples programmatically. Our focus is on developing a robust EWOD microfluidic chip able to manipulate large numbers of samples, in parallel and without cross contamination. Example of two reagents being manipulated simultaneously on the programmable chip. To that end, we have created a large 2D grid array on inexpensive manufactured printed circuit boards (PCBs) with direct addressability on each electrode. Direct addressability at large scales provides a method for users to customize the microfluidic chip, allowing multiple experiments to run in parallel. Running experiments in parallel allows for more results and variations of a given experiment. 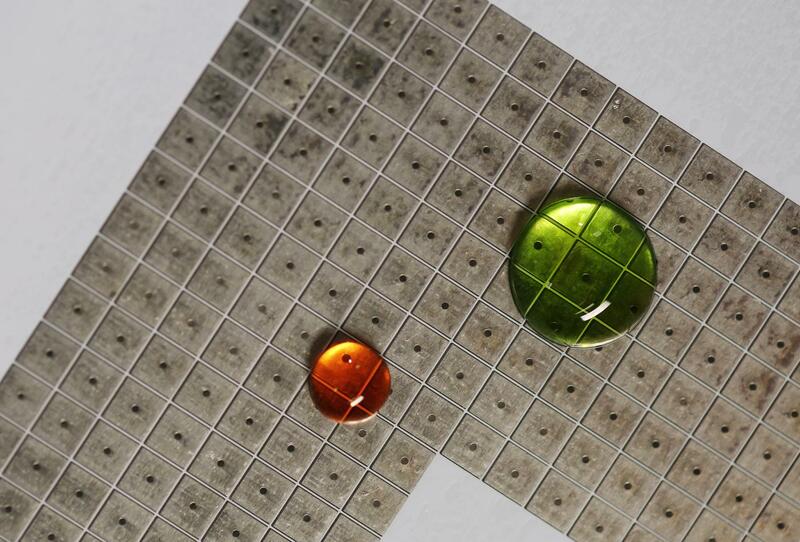 This work also includes development of various surface coatings for the microfluidic chip that inherently prevent a droplet from leaving behind a trail—thus avoiding cross-contamination. Our ultimate goal: scale this technology toward massive parallelization of programmable droplet manipulation. This will enable faster drug discovery and detection of diseases.